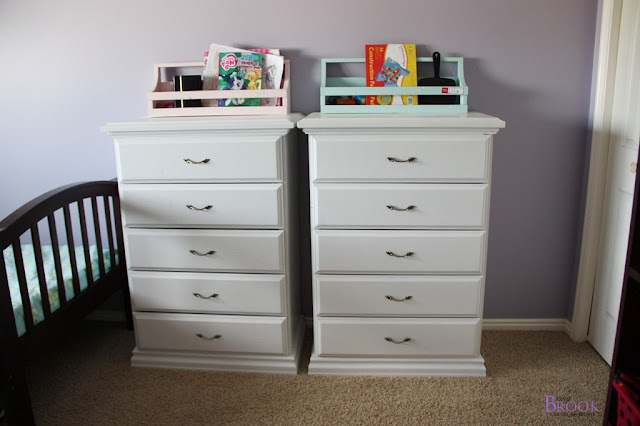 I'm excited to show you my nieces shared bedroom update. Sometimes when reading blogs or looking at pinterest I get totally overwhelmed and want to do NOTHING since what I see just seems impossible. So with my brother's house I'm trying to focus on all the little changes that didn't take a ton of time or money but really improved the rooms! 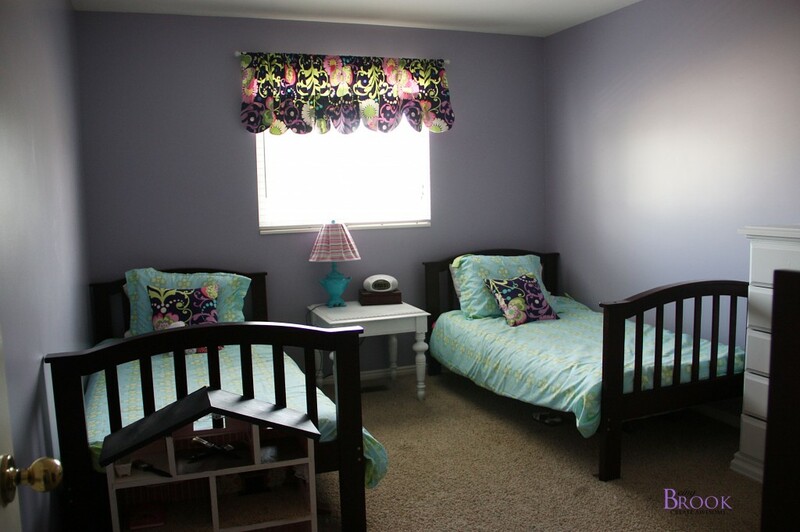 Here is how the girls room turned out! 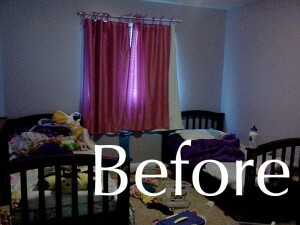 Before (this was right after their bedrooms got swapped so ignore the mess!) The walls were already purple which the girls love so no repainting and their dressers were in great condition and the same style but not the same color. 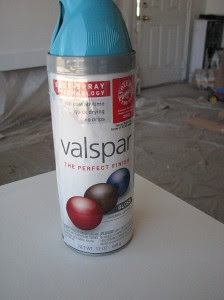 The first thing I did was repaint the dressers using a 4 inch foam roller and paint brush. 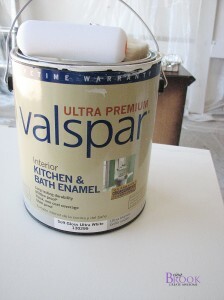 I primed both dressers with Zinsser 123 Primer and painted 2 coats of Valspar Kitchen and Bath Enamel in Soft Gloss. The same paint as the laundry dressers and boy dresser. The pulls got replaced with matching ones from Lowe's that were only $1 each! 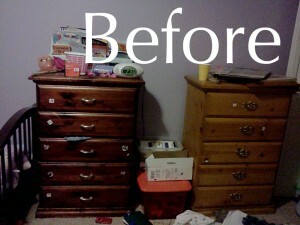 The dressers look so much better now they are the same! The cute book bins are ones we made the girls for Christmas. 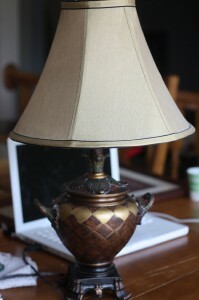 The next thing I did was paint a lamp that used to be in the master bedroom. 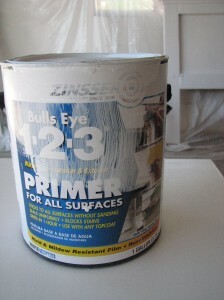 I primed it with Zinsser 123 spray primer followed with a few coats of Valspar turquoise spray paint. The shade got recovered with some striped fabric from my Grandma's fabric stash. 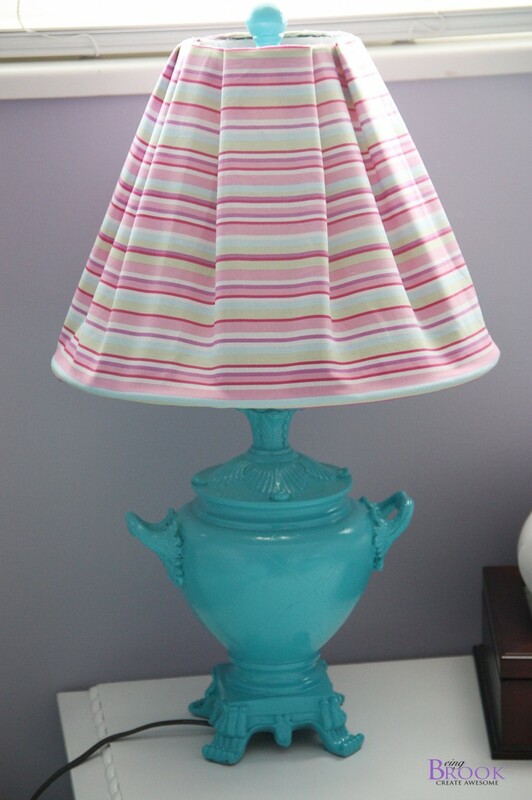 So the lamp makeover was just the cost of the spray paint. My Mom sewed an adorable valance using Amy Butler Love fabric in garden midnight. 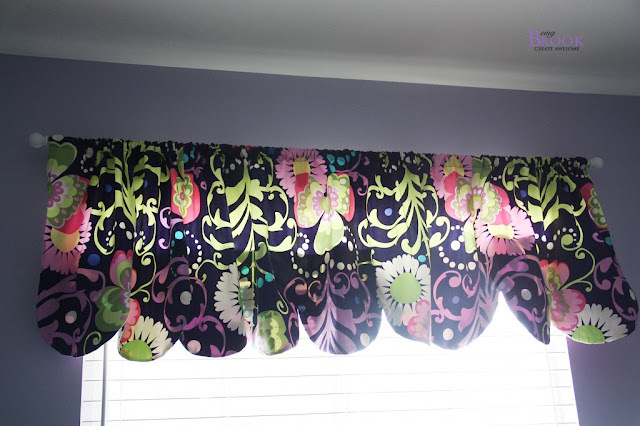 The fabric used to be in my old craft room so the fabric was free. I really like it in the girls room because it has so many colors and really helps pull everything together. I bought the aqua/lime duvets on clearance at Target-they are only $10! My Grandma made a cute throw pillow for each bed out of the same Amy Butler Love fabric as the valance. I found the end table in my brother's basement and spray painted it white. Love how it turned out! Plus I love that it didn't cost much and we only spent a day painting and sewing to update it!